Today is the final day of the Techweek conference in Kansas City . This week-long event fosters and promotes entrepreneurship and innovation, and it is considered one of the best festivals for entrepreneurship networking in the nation . In recent years, Kansas City has worked to position itself as a hub of entrepreneurship, and Techweek reinforces that image. 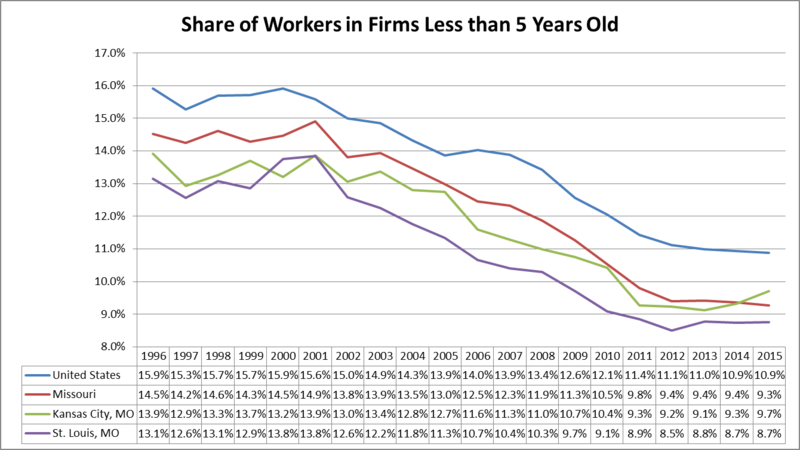 At the national level, the share of workers in firms less than 5 years old is now at 10.9%, the lowest it has been on record . The trend prevails in Missouri as well—the state now sits at 9.3%. A look at the table below shows that Missouri and its two largest population centers were growing with the U.S. average share until 2001. Since then, Missouri, has lost a larger percentage of its startup workers than the nation, and Kansas City and St. Louis have lost a larger percentage than Missouri.